A Response to Sen. Makey and Rep. Alexandria Ocasio-Cortez – Nuclear power has a large carbon footprint, its waste lasts millions of years, there is no place to store it, it must be treated with great seriousness and it must be excluded from the Green New Deal. Tragically it is not. If you consider nuclear power zero carbon, you are looking only at the direct emissions of the plant. 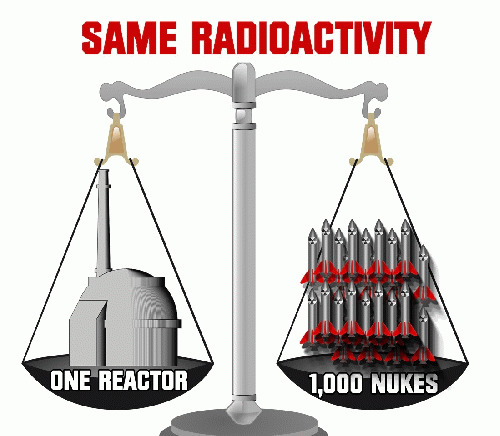 RadiationTruth tells us very clearly that nuclear’s carbon footprint is second after fossil fuels because of, for example, extraction by mining uranium or thorium ore, from which nuclear fuel is made; milling; conversion; enrichment; nuclear power plant construction; waste storage; monitoring radioactive waste forever; damaged reactors; accidents; and clean up after accidents. After 60 years (1957-2017), nuclear power reactors in the United States have generated roughly 30% of the total global inventory of spent nuclear fuel (SNF) – by far the largest. Yet at the same time, decades long efforts and billions of dollars of investment have failed to secure one geological disposal site for commercial spent fuel. The Yucca Mountain underground facility, selected on political grounds and decades in the construction was cancelled on scientific and public acceptance grounds by the Obama administration in 2010. 2) The cost of cleaing up America’s nuclear waste is enormous. On 1.29.19, NBC news reported “WASHINGTON – The estimated cost of cleaning up America’s nuclear waste has jumped more than $100 billion in just one year, according to a DOE report – and a watchdog warns the cost may climb still higher. 3) On 1.31.19, The Boston Globe published a story about Rowe, MA: “ROWE – The nuclear plant deep in the woods of this Western Massachusetts town stopped producing power 27 years ago when George H.W. Bush was still president. It was dismantled, piece by piece. Buried piping was excavated. Tainted soil was removed. But nestled amid steep hills and farmhouses set on winding roads, something important was left behind. Under constant armed guard, 16 canisters of highly radioactive waste are entombed in reinforced concrete behind layers of fencing. These 13-foot-tall cylinders may not be much to look at, but they are among the most expensive dumpsters in the country, monuments to government inaction. Judge Miranda Du issued a ruling on the state’s request for a preliminary injunction on Wednesday, the same day that the federal government disclosed it had secretly already made the delivery sometime before last November. The ruling does not address the state’s new request for a 14-day temporary restraining order, which was announced Wednesday during a press conference in which Nevada’s governor and attorney general expressed their outrage over the clandestine shipment. The ruling is a setback to state leaders, who were not informed of the delivery or its transport route. They accused the federal government of lying to them by making the delivery while the state believed it was still negotiating in good faith to prevent such a shipment. Members of the congressional delegation also expect to continue the fight. Nuclear power is a moral, safety and public health issue. Nuclear power is a crime against humanity, all living creatures and Mother Earth. 1) The bipartisan bill, approved by voice vote, is aimed at boosting nuclear energy and would modernize the federal government’s approval process for advanced reactors. The approval comes a day after the Senate did the same. President Trump is expected to sign the bill. The legislation directs the Nuclear Regulatory Commission to create a licensing process for advanced reactors that is less prescriptive, allowing for faster approvals. 2) “WASHINGTON, D.C.-Today, Congress passed the Nuclear Energy Innovation and Modernization Act (NEIMA) (S. 512), introduced by Sen. John Barrasso (R-Wyo.). Further, the federal government must immediately end the massive, irrational subsidies and other financial support that fossil fuel, and other dirty energy companies (such as nuclear, waste incineration and biomass energy) continue to receive both domestically and overseas”. As the United States shifts away from fossil fuels, we must simultaneously ramp up energy efficiency and transition to clean, renewable energy to power the nation’s economy where, in addition to excluding fossil fuels, any definition of renewable energy must also exclude all combustion-based power generation, nuclear, biomass energy, large scale hydro and waste-to-energy technologies”. Further, we will vigorously oppose any legislation that: (1) rolls back existing environmental, health, and other protections, (2) protects fossil fuel and other dirty energy polluters from liability, or (3) promotes corporate schemes that place profits over community burdens and benefits, including market-based mechanisms and technology options such as carbon and emissions trading and offsets, carbon capture and storage, nuclear power, waste-to-energy and biomass energy”. D. Nelkin, “Native Americans and Nuclear Power,” Sci. Technol. Human Values, 6, No. 2, 2 (1981). 2) “SNAP-SHOT” of environmental and economic justice issues in indigenous lands (US-CANADA)” INDIGENOUS ENVIRONMENTAL NETWORK. “Ocasio-Cortez also clarified that under the plan, the U.S. will not invest in new nuclear power plants, but existing generation stations would be allowed to continue operating at the end of the 10-year time frame. Nuclear power plants generate 20 percent of the nation’s electric power and 63 percent of its zero-carbon power. “The goal is to use the expansion of renewable energy sources to fully meet 100% of our nation’s power demand through only renewable sources in 10 years, but since no one has yet created a full plan to hit that goal, we are currently unsure if we will be able to decommission every nuclear plant that fast,” Ocasio-Cortez’s office said in an FAQ.” “No Nuclear Power, Ocasio-Cortez Says in Green New Deal”Nuclear power may be carbon free, but the progressive creators of the sweeping Green New Deal climate plan to stave off a global warming disaster have some bad news for boosters of atomic energy: No nukes allowed. The lofty environmental plan that seeks to eliminate global warming causing greenhouse gas emissions is being unveiled Thursday by progressive newcomer Rep. Alexandria Ocasio-Cortez (D-N.Y.). A pay wall comes down after the last line above, so if there is more to the story, I have not read it. I am in the process of writing to the author. Here are a few questions that remain for me: Since none of the above statements are in the Resolution, I am wondering why they are not included. Furthermore, what do we do while we “transition away from nuclear power?” Some plants are still licensed for many years out. Do we wait until their licenses expire? As the 8th anniversary of Fukushima approaches, March 11, 2019, we will have to hope and pray that no other nuclear power plant has a melt down while we wait to transition.The response that we must keep nuclear power plants open in order to maintain jobs of the people who work there, can easily be refuted by an important approach taken by the Green New Deal – that is, by creating many, milllions of new jobs. Some of those new jobs presumably would be in solar and wind energy and hopefully would be available for former nuclear power plants workers, who wanted to be so trained.. Moreover, we need people who know the plants to work on decommissioning them and we need people who know the plants to be there to guard the spent nuclear fuel rod. Finally, there can be enough wind and solar to stop the climate crisis, if the government becomes serious about turning around the climate crisis. Moreover, Tesla’sbatteries storage will help provide sufficient electricity (when the wind is not blowing and the sun is not shining.) The Green New Deal must not include nuclear power. We must close all existing nuclear power plants now and must not build any new plants, either with old or new technologies. Previous Swanson on Syria, Iraq, Venezuela, etc.